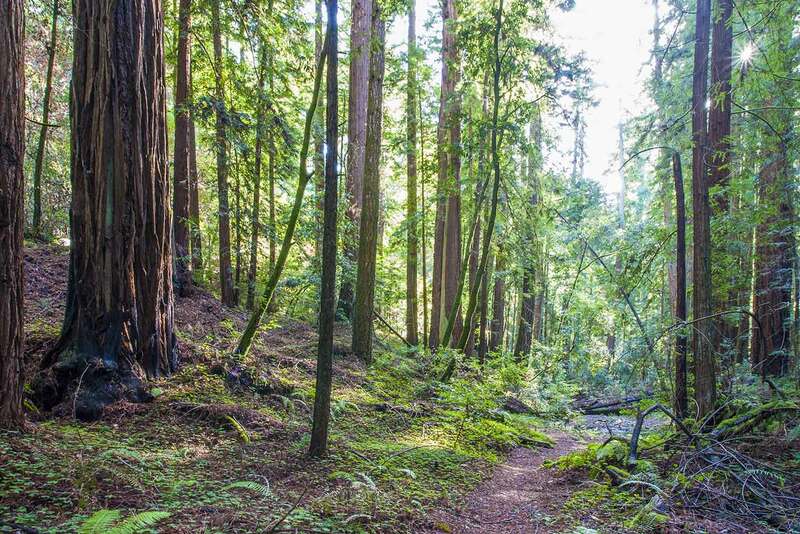 The Peters Creek hike features a descent into one of the Santa Cruz Mountains’ incongruously lush, redwood-filled canyons. This particular canyon, although not completely unlogged, is in unusually good condition. The redwoods aren’t immense, but there are some pretty good-sized trees, and the grove has an unusually plush carpet of redwood sorrel that gives it a lush and very attractive appearance. 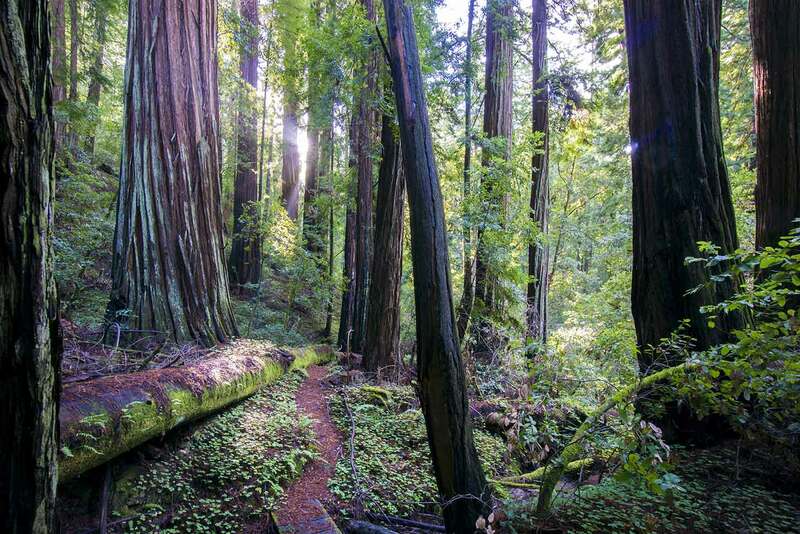 Getting there requires a challenging 5 mile walk each way through hilly, partially-logged redwood uplands, but it’s a pleasant walk and the old-growth grove is a rewarding payoff. 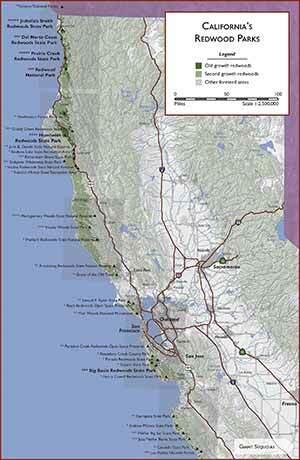 There are also some isolated large redwoods on the way. 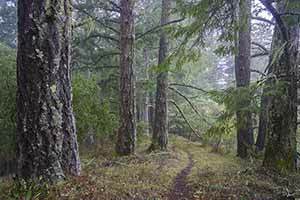 The main drawback of this hike is the lack of variety; the entire hike is wooded and the middle part passes through unexceptional uplands clogged with a dense tanoak understory. 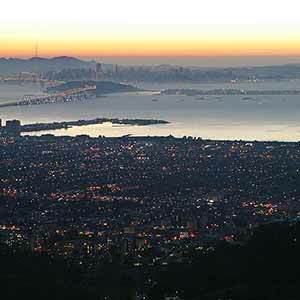 This hike can also be more exhausting than the elevation profile suggests: the steep climb at the beginning combined with a second steep climb halfway through has a way of sapping your energy. 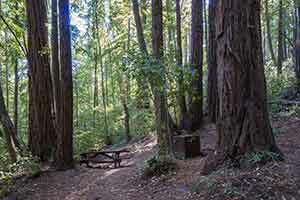 As the Bay Area’s redwood parks become increasingly popular, this trail, like Portola Redwoods as a whole, has remained wonderfully quiet and undiscovered; there’s never any problem finding a parking spot, and on the trail you might see one or two groups of hikers all day. 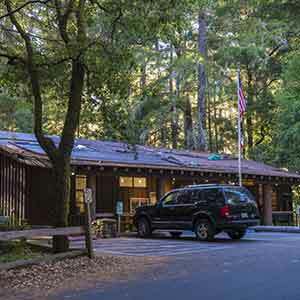 Starting from one of the parking lots near Park Headquarters, walk south on the paved service road. Walk past the Old Tree Trail and over a few small rises, then turn left at the Summit Trail. This trail starts as a dirt road but soon turns into singletrack. 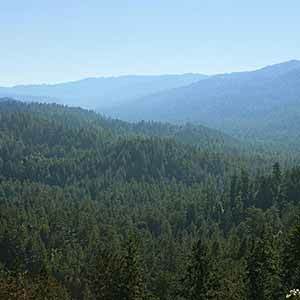 It climbs insistently past mid-sized redwoods, then reaches a summit and descends to an intersection with the Slate Creek Trail. 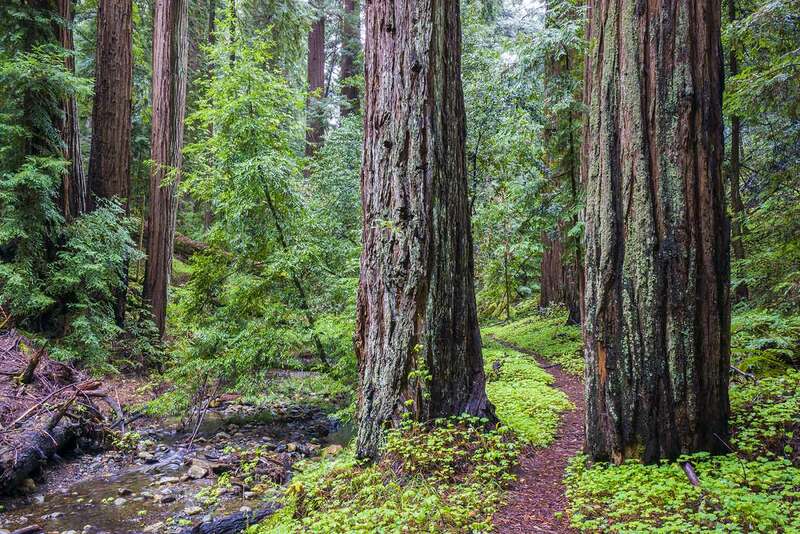 Although the trees aren’t very big, this area appears to be unlogged and has some nice patches of redwoods, especially at the intersection of the Summit and Slate Creek Trails. Turn right onto the Slate Creek Trail. The distant sounds of gunfire from the Los Gatos Rod and Gun Club, about 5 miles away, can sometimes be heard. The trail is level and well-maintained, making this part of the hike quick and easy. The trail passes through a saddle and enters a wide, shallow basin that’s clearly been logged, with lots of mid-sized redwood stumps. Fortunately the forest seems to be regenerating nicely, with none of the gloomy or dismal look that second-growth forests often have. There’s a very dense understory of huckleberry shrubs. At the 5-way intersection by the Slate Creek Trail Camp, turn left onto the dirt road that climbs gently. A discouraging sign warns that the hike to Peters Creek is a strenuous 7-mile round-trip from this point. The road runs through one of the more intensively-logged sections of forest, but the woods are relatively open and bright, and the late-afternoon sunlight slanting through the trees can make the area attractive. The road, now cut into a hillside above a canyon, soon narrows to a trail. The stumps end at this point and a smattering of old-growth redwoods appears in the canyon, with about eight pretty good-sized redwoods and many smaller ones. You have to peer through the dense screen of tanoak to see some of the redwoods. 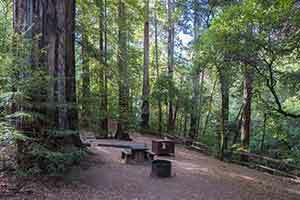 The trail leaves the redwoods and briefly climbs through thick brush, then enters an attractive wood near the highest point of the hike. The trail becomes narrow and overgrown at this point. There’s a lot of poison oak from here to the canyon bottom; just before the high point of the hike is an especially bad area where the trail can be completely overgrown with poison oak. The trail begins a steep descent into the Peters Creek canyon. The trail, which can be faint in this area, at first descends through a grove of light-colored fir trees. Near the start of the descent is a brief and very limited view through a small break in the trees. The high ridge in the distance is Butano Ridge and is part of Pescadero Creek County Park. Below that is a prominent knob; the Slate Creek Trail, which you just hiked, is cut into the left side of that knob. The woods get noticably more lush as the trail approaches the bottom of the canyon. 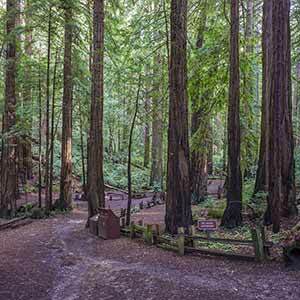 The trail rounds a bend and passes through a small band of redwoods, then descends a little more and enters a darker, lusher redwood grove. The change in the landscape is sudden and dramatic; it feels like a different world in the redwoods. As the trail descends into the cool deep shade of a vast sea of redwood foliage, a creek burbles below and the steep hillside is covered with the most extensive carpet of redwood sorrel that I’ve seen in the Bay Area. There’s a dense understory of tanoak. The narrow, steep-sided Bear Creek canyon is the lushest and most impressive part of the old-growth grove, and it appears to be in pristine, unlogged condition. 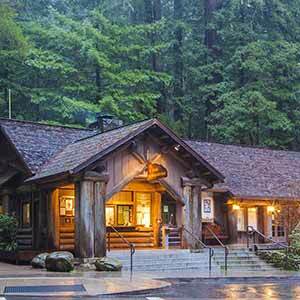 The redwoods are quite a bit bigger than they are in the Park Headquarters area. The area where the trail crosses Bear Creek is the most scenic of the trip; the trail then runs along the hillside above the creek to the loop trail intersection. Turn right to follow Peters Creek. This wider, brighter canyon has some signs of logging, with a few huge redwood stumps and some more small ones. Only the banks of the creek seem to have been logged, though, and the rest of the area still has an old-growth appearance, with some big redwoods. 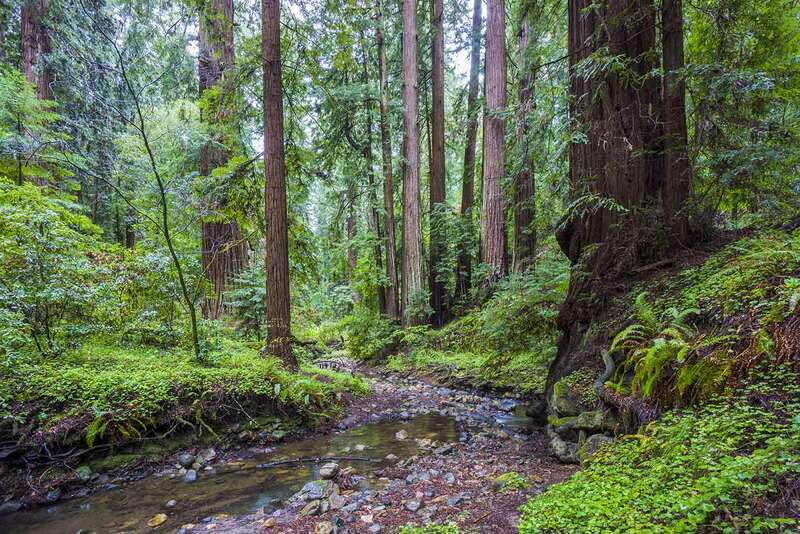 Just before the trail crosses the creek it passes an especially large redwood, maybe the biggest in the grove. The creek crossing doesn’t have a bridge but is normally only a few inches deep, even when it’s raining. However, the scenery isn’t quite as good on the other side, so you don’t miss too much if you decide not to cross. The trail climbs to an old, straight roadbed that runs high above the creek, along the edge of the old growth. The trail crosses the creek again. Compared with the northern half of the loop, the southern half isn’t quite as as lush and scenic, and is more clogged with tanoak. The most scenic part of the loop is the very end, where the trail reaches the mouth of the Bear Creek canyon. Turn right to rejoin the Bear Creek Trail and return the way you came. The climb out of the canyon has an unusually steep 16.5% grade and can be slow and tiring. Once you reach the top of the canyon, the rest of the hike is a fast, gentle descent. 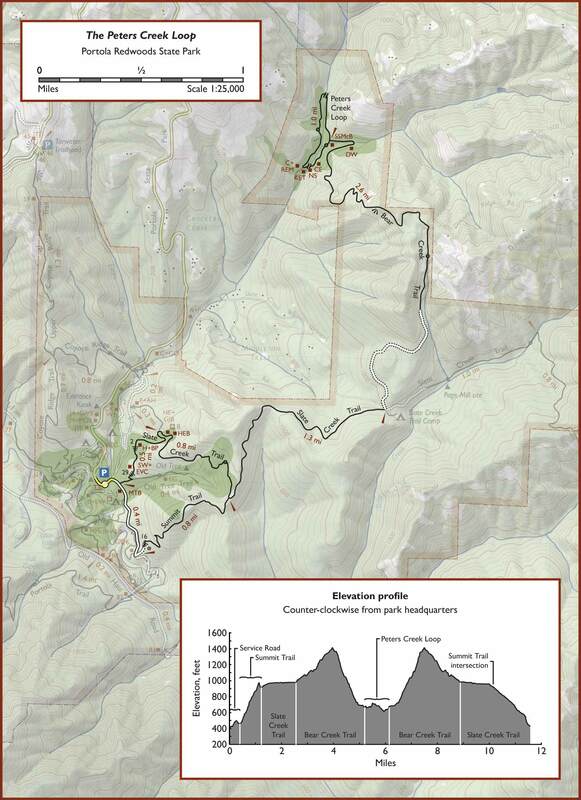 For variety, take the Slate Creek Trail instead of the Summit Trail back to the park headquarters area. 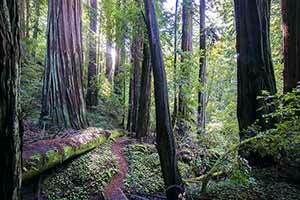 The Slate Creek Trail meanders through attractive old-growth redwood uplands with small to mid-sized redwoods. Here are a few more photos of the Peters Creek hike.